Serving delicious Wholly Guacamole dips and salsas as appetizers was such a hit at our Christmas Gathering that I plan to stock up for our New Years Eve dinner party too. Haven’t tried Wholly Guacamole yet? It is one of my favorite healthy lines of 100% natural and preservative free guacamoles, salsas and queso dips. The Guacamole dip is made of 90% hass avocados with 10% spice mix. It is creamy and so delicious. I also appreciate that it is a healthy treat that I can feel good about serving to my family, including healthy fats, vitamin B6 and Folate. The Wholly Salsa tastes so fresh it is almost like it was picked from our garden. It is the perfect blend of vine-ripened tomatoes, lime juice, onions and cilantro and other natural flavors. My party guests could not stop raving about the Wholly Queso which is a mildly spicy cheese dip that is hard to stop eating and before I knew it we needed to refill our bowl. The Blanco Wholly Queso is a delicious combination of white cheeses and chock full of vegetables that blends together so nicely. I love the Recipe section at the Eat Wholly website which gave me lots of ideas to “wow” my guests including the Sunset Guacamole and the Picadillo Nachos. You can pick out your favorite recipes too. Wholly Guacamole and other Eat Wholly products are the perfect party foods so the next time you are at the grocery store don’t forget to stock up! 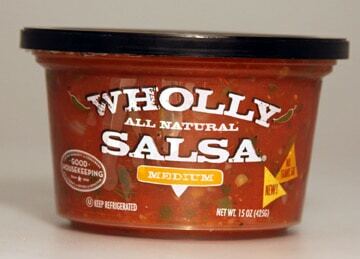 To learn more about Wholly Guacamole and their other signature salsas and queso dips go to their website. Want More Exposure for Your Handmade Business? Love their guac! It tastes just as good as homemade and is sometimes cheaper depending on the market price of avocados.